A modern classic, Housekeeping is the story of Ruth and her younger sister, Lucille, who grow up haphazardly, first under the care of their competent grandmother, then of two comically bumbling great-aunts, and finally of Sylvie, the eccentric and remote sister of their dead mother. The family house is in the small town of Fingerbone on a glacial lake in the Far West, the same lake where their grandfather died in a spectacular train wreck and their mother drove off a cliff to her death. It is a town "chastened by an outsized landscape and extravagant weather, and chastened again by an awareness that the whole of human history had occurred elsewhere." Ruth and Lucille's struggle toward adulthood beautifully illuminates the price of loss and survival, and the dangerous and deep undertow of transcience. Marilynne Robinson is the author of "Gilead," winner of the Pulitzer Prize for Fiction and the National Book Critics Circle Award, and "Home," winner of the Orange Prize, the L.A. Times Book Prize, and a finalist for the National Book Award. 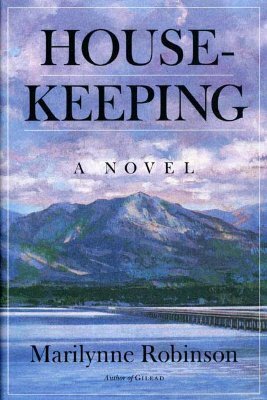 "Housekeeping" was her first novel and won the PEN/Hemingway Award. Robinson's nonfiction books include "Absence of Mind," "The Death of Adam," and "Mother Country," which was nominated for a National Book Award. She teaches at the University of Iowa Writers' Workshop and lives in Iowa City.